Make God’s promises for you a reality! God’s Word is packed with promises He’s made to His people throughout the ages. If you find yourself in a time of need, it’s time to take hold of a promise and reap the blessings He has in store for you. To do that, you need to understand His nature and your role in the process. 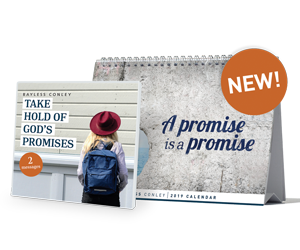 So request your Promises package when you give today! And thank you for your partnership and support that make it possible to take the love of our living Jesus to those in need of His faithful promises. Your recurring gift will transform even more lives. Please consider giving a monthly gift. The US Internal Revenue Code permits you to deduct the amount you give to Answers with Bayless Conley that exceeds the fair value of materials received from us. To assist you in determining the tax-deductible portion of your gift, the fair value of any materials you receive from us will be shown on your receipt. If no value of resources is indicated, no goods or services were given in exchange for your gift. Your donation to Answers with Bayless Conley is tax deductible to the extent allowed by IRS regulations. We will send a receipt once your donation has been processed. If you select a recurring donation, we will send a receipt each month once your donation has been processed. We will not share personal information you entrust to Answers with Bayless Conley with anyone else. If you prefer to donate by check, please make it payable to “Answers” and mail to PO Box 417, Los Alamitos, CA 90720. Click here for "More Ways to Give."